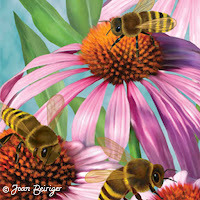 The January Atlanta Gift Show is really two shows in one for artists that license their art. The main purpose of the show is for manufacturers to sell products to retailers. But it is also an excellent way for artists to find manufacturers that license art and to check out trends by walking the show. * The show also has a License and Design area where artists can exhibit their art to be seen by the many manufacturer art and licensing directors that attend the show. * December 2011- Update on artists registering for the show. The Atlantas Mart has changed their policy starting with the January 2012 show. The show is for wholesale buyers only and artists must either meet their wholesale buyer requirements in order to walk the show or exhibit in the License and Design area. The AtlantasMart Atlanta is the largest permanent wholesale marketplace of its kind. It has about 4500 exhibitors in three multistory (13 to 20 floors) buildings connected by bridges on selected floors. The Mart expected to have 92,000 retail buyers attend the show. That was before a huge snow storm hit Atlanta which canceled flights the day before the permanent showrooms opened on Wednesday, January 12. And the icy roads around the Mart made walking and driving very difficult. The weather may have stopped some buyers from attending but according to blog posts by retailers and trade magazines the show was hopping by the time the temporary showrooms opened on Friday, January 14. And buyers were definitely purchasing products! Some exhibitors said that this was their best show in five years. This is REALLY good news because if stores are not buying product then licensing revenue to artists would drop or even stop and manufacturers will not license more art. If you have not been to the Mart, catch a peek at some of the showrooms and product "eye candy" by viewing four short videos on youtube.com produced by AtlantasMart (AMCConnectVideo). This is the third year for the License and Design section at Atlanta where artists exhibit their art to be licensed. The section is slowly growing and much smaller (27 booths) than the Surtex show (over 300 booths). Some artists and agents exhibiting in the section had a very difficult time getting to Atlanta but all were able to setup in time for the Friday opening day. The new location made it easier for manufacturers to find even with the wrong advertised location showroom number and the lack of signage. According to many of the artist blogs (listed below), the exhibitors made lots of contacts with manufacturers and felt they had a successful show. However, with any licensing show the "proof in the pudding" is how many of the contacts made at the show turns into licensing contracts. Most times only a small percentage do and those can take months and even years. And that will not happen unless artists and agents follow-up with the contacts they made. Find out more about the REALITIES of the show and what happens after the show by reading licensing agent Jim Marcotte of Two Town Studios article "Now the real work begins!" And also read "Atlanta Snippets" by Jim on comments he heard at the show. View the following blog articles, for artist experiences in walking and exhibiting at Atlanta, pictures of an artist booth, and see artists art on products introduced at the show. Note: For artists new to licensing, viewing these blogs is an excellent way to see what themes and kind of art have been licensed. 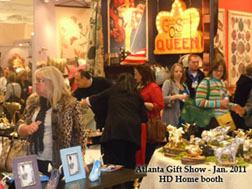 Carol Eldridge "Atlanta Gift Show and License and Design Show"
Ellen Crimi-Trent "Back from Atlanta-follow up!" Jane Maday "More Gift Show Chat"
Jane Shasky "AmericasMart - Atlanta"
Kate Harper "Working With Leanin' Tree"
Phyllis Dobbs "Atlanta Gift Market - An Inspiration for good things to come!" Robin Davis "Pictures from The Atlanta Gift Mart"
Comments and suggestions are welcome. Please click on comments and write them in the comment window at the bottom of this article. Thank you so much for sharing.. Atlanta is on my list of shows to attend, it's great to get a little glimpse ahead of time!